One weekend in May, Marcus and I decided to finally try macbar, the macaroni-and-cheese annex of Nolita's Delicatessen, a hip diner where you can find its advertised "international comfort food." Chef Michael Ferraro, who runs both joints, put together a menu of a dozen varieties of "gourmet" mac-and-cheeses. Talk about embracing comfort food! 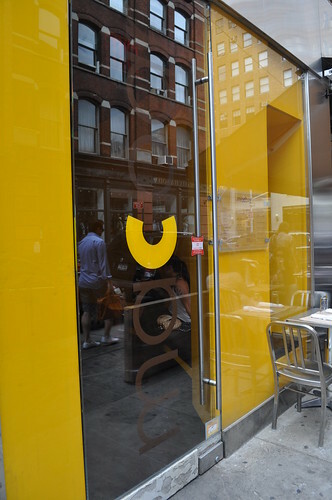 I thought the elbow macaroni logo (which also serves as the "c" in macbar") was quite typographically witty! The macbar menu consisting of twelve different kinds of mac-and-cheese, both traditional and unique! 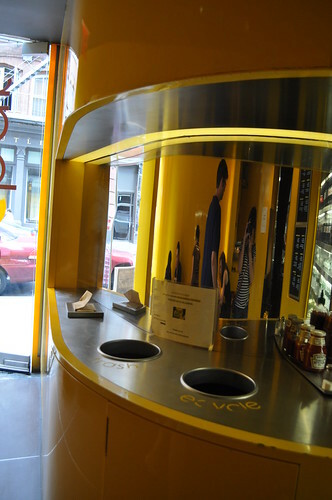 Inside macbar! Even the seating area is reminiscent of the shape of elbow macaroni! Medium- and large-sized portions medium and large order come in these bright yellow, elbow-shaped plastic bowls by package designer, Ron Lerner. Even the handle of the plastic, jigsaw-like fitting utensils are shaped in the same hollow fashion as elbow macaroni, too! 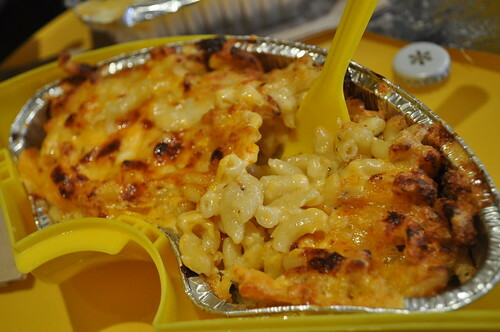 All menu-items are made-to-order and are individually baked in their own foil trays, guaranteeing freshly baked "homemade"-style mac-and-cheese! But be wary though -- they are scorching hot when they're ready and served to you, so be careful! Marcus ordered a medium-sized Classic, consisting of elbow macaroni with American and cheddar cheeses. Surprisingly, Marcus wasn't a huge fan of this style of macaroni (i.e., "casserole"-like) -- he prefers the kind of mac-and-cheese where the consistency is creamier (without the layer of crisp, casserole-from-the-oven cheese on top). Nevertheless, he still found it to be pretty good mac-and-cheese if casserole is the way you like it. For me, this is truly the "classic" homemade mac-and-cheese comfort food you remember finding in your childhood kitchens (made with love, of course)! I initially wanted to try the Mac Lobsta' (with tender chunks of fresh lobster, cognac, tarragon, and marscarpone) firstly because I love lobster, and secondly, because it didn't have any cheeses that would do somersaults in my sensitive stomach. Only problem was that macbar was out of Mac Lobsta' for the day, so I had to seek an alternative! After thoroughly perusing the twelve different offerings on the menu, I decided on a small-sized Mac 'Shroom, which had my all-time favorite vegetable, mushrooms! The Mac 'Shroom was comprised of elbow macaroni with roasted "magic" mushrooms, fontina, mascarpone, and truffled essence. I was wary about the fontina (i.e., a cheese that my taste buds and stomach aren't very familiar with), but I decided not to fuss over it. Luckily, all was well, and I quite enjoyed the mushroom mac-and-cheese with a hint of truffle oil! I would have to say my favorite part if the burnt cheese on top -- adds a nice crispness to the softness of the underlying cheese and elbows. For all of you tall folks out there, be careful with the waste receptacle area. Marcus hit is head on this illusive mirror cut-off thing while he was disposing of our finished platters of mac-and-cheese! 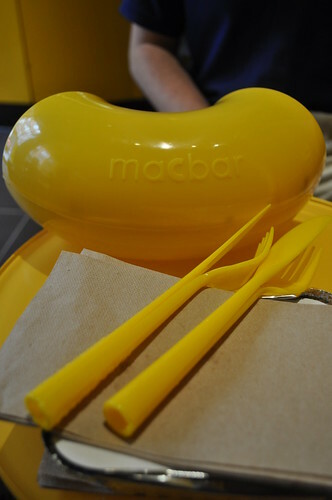 Findings: For mac-and-cheese lovers, I would say macbar is just for you. 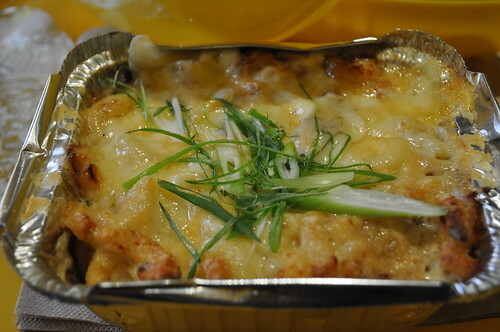 With a varying menu offering a dozen gourmet combinations of traditional as well as unique ingredients, macbar is bound to have a mac-and-cheese that's right up your alley. The prices are pretty reasonable, considering everything is made-to-order and comes to you scorching hot, right out of the oven. I would definitely love to go back to try the Mac Lobsta', which I think I would've enjoyed a lot more, not because the Mac 'Shroom was bad or anything, but just because it's just straight mascarpone! If you can't decide, you can't go wrong with the traditional Classic -- after all, there's nothing like the homemade mac-and-cheese that Mom used to make in a casserole pan for special occasions. Price point: medium-sized Classic for $7.99, small-sized Mac 'Shroom for $7.50. Fontina is my cheese love. Yum to the max. 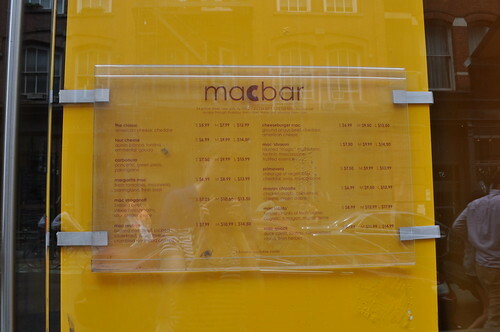 When going through NoLita, we can't seem to stay away from MacBar! 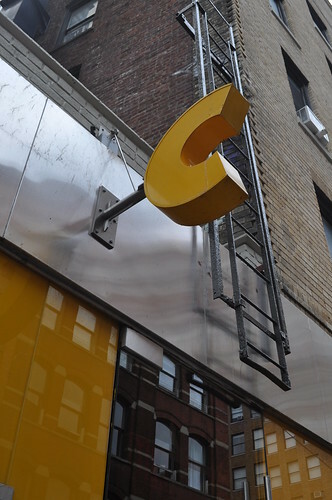 It's always wandering down Prince St. in NYC that catches us every time. We can't resist going in and ordering some Mac Lobsta'. It's absolutely delicious!